Lighthouse Family, one of the most successful bands of the late 90s and early 00s, return with a new studio album – their first in 18 years. Blue Sky In Your Head will be released in May and will include Essentials, all the bands classic songs remastered for the very first time to celebrate their 25-year recording history. The lead single My Salvation joins their timeless hits Lifted, High, and Ocean Drive, which are all included on Essentials. 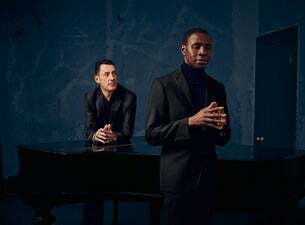 Blue Sky In Your Head is Lighthouse Family’s fourth album, which the duo will celebrate with a huge UK tour later this November, culminating at the iconic London Palladium on 22 November 2019. Tunde Baiyewu and Paul Tucker formed Lighthouse Family after meeting at Newcastle University in the early 1990s. Their 1995 debut album Ocean Drive went six times platinum while staying in the album charts for almost three years. Lifted became one the defining songs of the era, that was inescapable on radio, becoming the soundtrack of high street Britain, drivetime Britain and night-out Britain. The 1997 follow-up, Postcards From Heaven, featured three Top Ten singles, Raincloud, High and Lost in Space – and also went six-times platinum, charting across Europe, the Far East, Australia and New Zealand. Their third album, Whatever Gets You Through The Day was released in 2001, and produced another Top Ten single (I Wish I Knew How It Would Feel to Be) Free/One. Their 2019 tour kicks off at Birmingham Symphony Hall on 11 November, before heading to Newcastle City Hall on 14, Nottingham Royal Concert Hall on 15, Halifax Victoria Theatre on 17, Manchester Bridgewater Hall on 18, Bexhill De La Warr Pavilion on 20, Bournemouth Pavilion Theatre on 21 and finally the London Palladium on 22 November 2019.